`Nannu Dochukunduvate` is a Watchable Romantic Entertainer!. Karthik is a Work Minded Techie (Manager) who is a Manager in an IT firm. Karthik`s Family plans to marry him off to his Sister-in-law but he has other plans. To avoid marriage, Karthik hires a Short Film Actress, Meghana (Nabha Natesh). She falls for Karthik and impresses his father too. But Karthik isn`t up for a serious relationship yet. How Meghana and Karthik unite forms the rest. Sudheer Babu enacts his role with a comfortable ease and is good. Nabha impresses (Telugu Debut) with her Hyper active Character and is totally charming. Varshini, Nazar, Tulasi and other supporting cast are also Decent. `Nannu Dochukunduvate` is a Pretty Decent and Watchable Romantic Drama with Family Emotions at its heart. The film is especially entertaining in the 1st half and has an emotional 2nd half. Entertaining Episodes and interesting Characterizations keep the film going although speed bumps here and there and predictable narration keep it off from becoming an outrightly good watch. 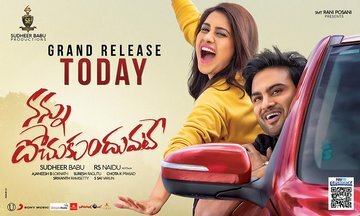 Box-office Verdict : With WW Theatricals Value at 6 Cr apx this probably will end as another Average Earner for Sudheer after Sammohanam.